All chassis components are controlled by the electronic chassis platform (ECP). It coordinates the shock absorbers’ action at intervals of milliseconds. The ECP collects comprehensive information about the movement of the car and the data from the chassis control systems involved. From these, it calculates and precisely coordinates the optimal function of these components in an integrated handling controller. Drivers of the new S models experience this progress in the form of precise handling and high transverse dynamics. in the previous model. The driver can switch it to a Sport mode or shut it down completely. On the S6, the horizontal splitter in aluminium look creates an enormous feeling of width at the front. It links the two air inlets and ends with the two winglets at the air ducts. 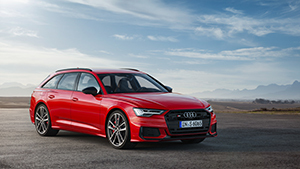 At the rear, the S6 features an integrated spoiler that visually extends the boot lid. Aluminum applications in the diffuser link the four S-specific tailpipe trims. These also underline the width of the vehicle. driver climbs in they are greeted by illuminated aluminium sill trims with S logo.